Swanswell is a charitable institution for the rehabilitation & alcohol counseling, based in the West Midlands, England. Founded in 1968 and developed as a large organization with over 100 employees spread across several cities in the UK. What is interesting is the concept of visual identity that is used by Swanswell. It's simple but quite unique and effective. 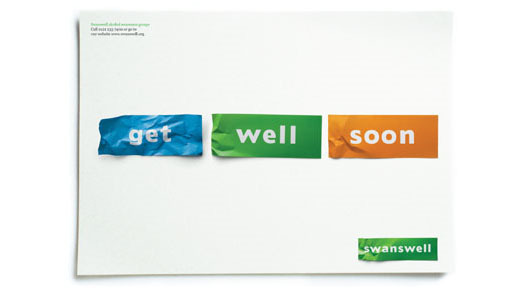 Swanswell use a crumpled piece of paper at one end but smooth elsewhere. A metaphor used to describe a change of condition is not good (the part that is wrinkled) to be good / well (smooth part). 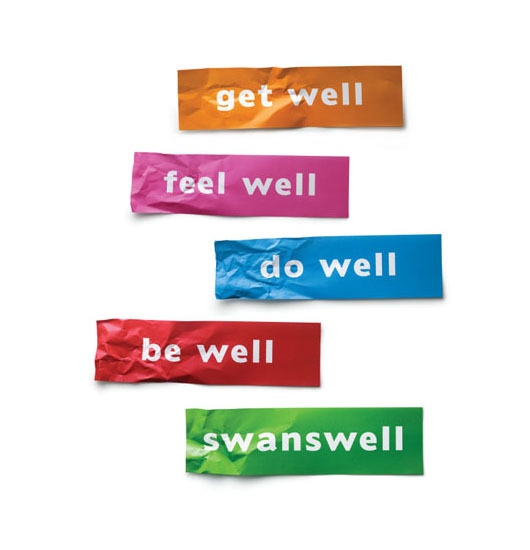 Swanswell Logo and visual branding concept are designed by Johnsonbanks, one of the branding agency based in London, England. This concept becomes more attractive when development and consistency is applied in a variety of visual communications media for all promotional items made by Swanswell. Some wording has also been prepared for various purposes such as promotional posters and so on. Quite interesting isn't it? but wait, not only that! Each worker was also given a special card that was originally not wrinkled. But when it's going to be given to others, they are required to squeeze one end first. I like the idea. Before and After - this thing gives confidence and that kind of people need this. Great design example of an identity. A fine example of how an identity design can inform subsequent and later designs such as posters, leaflets etc.